amongst the rocks and pines of one of the most beautiful inlets along Georgian Bay. We cater to both family and fishing vacations, and are open all year round. We offer fully equipped private housekeeping cottages, all with a breathtaking view of Georgian Bay. During your stay, enjoy complimentary use of canoes, sailboards, paddleboats, barbeques, a game room with a pool table and Jacuzzi tub. 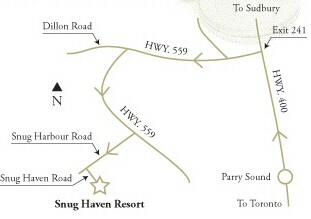 Note: All prices are per cottage and include the number of guests indicated. For each additional person over, please add $20.00 per person per night or $125.00 for the week. Blankets and pillows supplied for each bed, linen supplied upon request for an additional charge. Weekend and group rates are available. All rates are subject to applicable taxes. A $300.00 deposit is required to confirm reservations and will be credited to your account upon your confirmed arrival date. Please note that it must be received 10 days after booking or your reservation will be cancelled. 30 days notice is required for a deposit refund. A $50.00 administration fee applies to all cancellations. Check-in time is anytime after 3:00 p.m. Guests arriving earlier may use the resort facilities. Check-out time is 9:00 a.m. The waterfront and other facilities of the Resort are only for our guests. Visitors of registered guests must check in at the Front Desk. There is a charge of $10.00 per person for the day use of our facilities. Regretfully, we cannot accept pets. Please inquire about nearby kennels.